On March 31, 2019, Joan Darling Nix Drew peacefully departed this world to be with her Lord and to reunite with all her beloved family and friends who preceded her. Joan was born on March 16, 1921 in Garnett, South Carolina, to Victor Hugo Nix and Rose McKenzie Nix. She was raised on the family farm in Garnett. 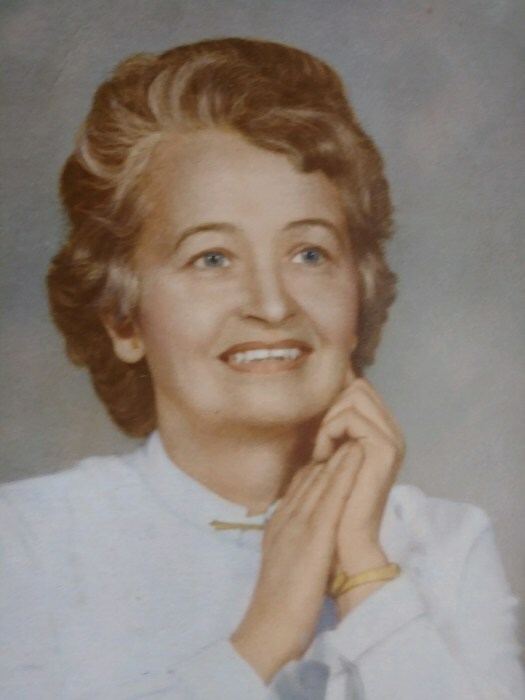 Joan attended Winthrop College from 1940 to 1941, with a major in BS of Home Economics, She transferred from Winthrop to Duke University and received her Bachelor of Nursing degree at the Duke Hanes School of Nursing in 1945. On June 26, 1946, Joan married Robert Mitchell (Bob) Drew and they resided in Clemson, South Carolina for 2 years, while Bob completed his degree at Clemson University, following his WW II military service. While there, Joan worked at the hospital in Seneca, South Carolina. After returning to Ridgeland for several years, they moved to Fort Knox, Kentucky where they both worked in Public Health. Subsequently, Joan, Bob, and children moved to Wilmington, North Carolina, where Bob was called into the ministry. Joan was his most faithful supporter as he worked towards his Masters of Divinity Degree at Duke University and throughout his many pastoral assignments throughout the North Carolina United Methodist Conference. The family was relocated to a new church community every 4 years (sometimes more often) and Joan facilitated each move with joy and welcomed the opportunity to serve with Bob wherever the Lord sent them. After Bob passed away on March 31, 1979, Joan moved to Fairmont, NC, where she and Bob had served Trinity Methodist Church from 1973 – 1977. She spent 35 years there. In addition to her duties as a Methodist Minister’s wife, Joan continued her nursing career, working in the local hospitals, taking on private duty cases, nurturing and healing wherever the need. She also worked with the American Red Cross and taught at Carolina Military Academy in Maxton, North Carolina. Joan loved her piano, she sang in the choir, she was well-read, loved the arts, loved animals, and was an accomplished seamstress. First and foremost, Joan was devoted to her five children. She recognized the strengths and gifts of each child and sacrificed to ensure that they had every opportunity to develop their talents and establish a foundation for life. Most of all, Joan instilled in them love, faith in God, Christian principles, and a zest for life. Joan is preceded in death by her parents, Rose McKenzie and Victor Hugo Nix; her husband, Robert Mitchell Drew; her sisters, Naomi Garbade, Emily Rose (Baby Rose) Martin, Martha Lee Dale, Marion Vickery; and her brother Victor Hugo (Sonny Boy) Nix, Jr.
Joan is survived by her Sisters, Fredna Lynn (Tena) McCormack and Willie Agnes (Bill) McCormack; her sons, Robert Mitchell (Robin) Drew, Jr. and James Stephen Drew; her Daughters, Martha Ann Drew (Sissy) Crisson; Joan Roselle Drew (Joanie) Ross; Mary Catherine Drew (Cathy) Mann. Joan was much-loved by her 10 grandchildren, 12 great-grandchildren, and 1 great-great-grandchild. The family extends their gratitude to the staff at Eno Pointe Assisted Living Home, for their loving care of Joan for the past five years. Deepest thanks, also, to the staff at Duke Hospice for making Joan’s final hours comfortable and peaceful, and for supporting our family during every phase. The family will receive friends from 2:00 p.m. – 4:00 p.m. on Wednesday, April 10, 2019 at City of Oaks Funeral Home, 4900 Green Road, Raleigh NC. A visitation will also be held at 1:00 pm on Friday, May 10, 2019 at St. Paul's United Methodist Church, 7488 W Main St., Ridgeland, SC followed by a memorial service in the church at 2:00 p.m. A short burial service will follow at Ridgeland Cemetery, Ingram Street, Ridgeland, SC. In lieu of flowers, donations may be made to Duke Homecare and Hospice at 4321 Medical Park Drive, Suite 101, Durham, NC 27704.